I'm making a baby poncho. Row 26: K5, *increase one stitch, K5 repeat from * ending K1 (20 stitches increased) and place last 3 stitches on holder (121 stitches on needles). Do NOT turn work, poncho will now be done in the round. Rounds start at the center front. Round 27: Join by holding stitch holder in front of work (overlapping the buttonbands) and P2tog using one stitch from the holder and one stitch from the buttonband on the poncho, repeat 2 more times. 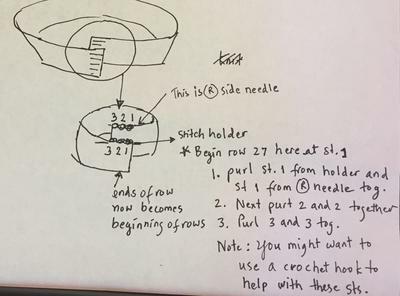 (121 stitches) Place a Marker. I am so lost. very confused on how to join. The yoke was knitted flat and now they want me to join.....but how? You're welcome. Glad it worked out! Thank you soooo much , I got it !!!! In order to joint row 27 in round, you have to have all of of the stitches on circular needles. start with a short one that fit well with the york first. Once you have done that then you place the last 3 sts on a holder. It is hard to explain how to do row 27, so I did a sketch for you. It'll be more clearer that just to say it. I tried my best and I hope it does the job. Please read instruction in the picture. 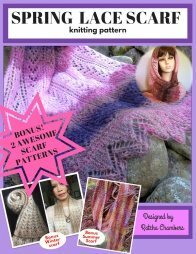 When the poncho is getting to tight for short circular needles then you can change it to a longer one. 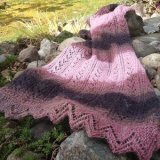 Best to your poncho project!